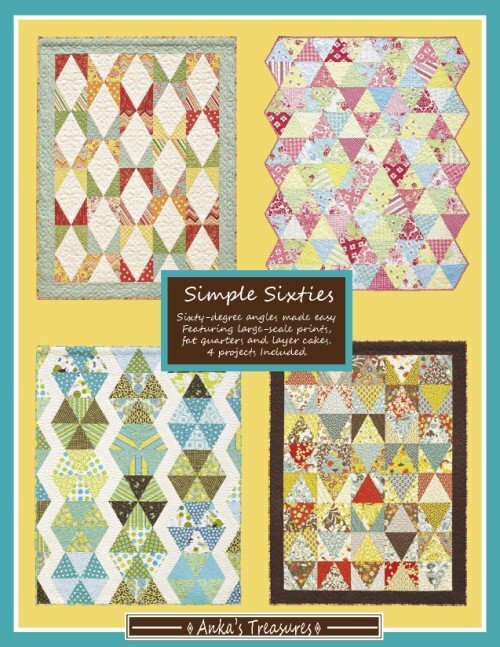 Simply Sixties: This pattern features four projects made with 60 degree blocks cut from precuts (layer cake-types) or fat quarters. Sixty-degree angles in quilts made easy! Featuring large-scale fabrics, fat quarters, and 10" squares. This pattern is written for use with Creative Grids' 8" (finished) 60-degree triangle ruler. Projects include: White Diamonds: 52" x 68-1/2"
Beach Balls: 58" x 75-1/2"
Staggered Diamonds: 53" x 69-1/2"
Scappy Sixties: 60" X 75"